We have completed another great project, of which we are very proud indeed. Not least because we have a very satisfied client in Belgium! This high-rise warehouse for Roger & Roger has an area of 105 x 36 metres and is 44 metres high. We provided cladding for the steel racks of this Croky Chips storage facility. A ‘tasty’ assignment indeed! Luckily, we already had a lot of useful experience with this kind of outer skin – and with this kind of height! All in all, we were responsible for the calculation, plans, manufacture, supply and assembly of all steel roof and facade cladding. 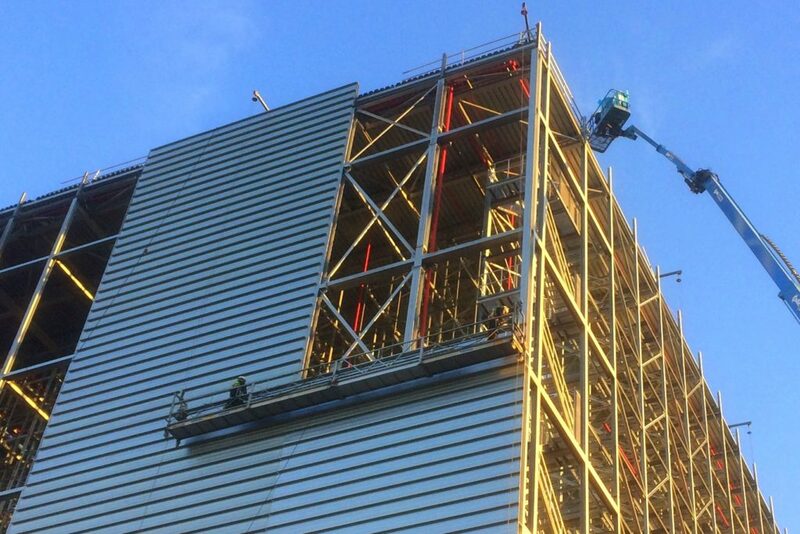 This involved some 3,805 m² of galvanised profiled sheet steel for the roof construction, approximately 9,020 m² of insulated wall construction and approximately 260 m² of profiled steel sandwich panels for roof construction. Nice work and a nice working relationship! We’ve left behind a crisp, fresh warehouse and a satisfied client. And that certainly tastes like more.